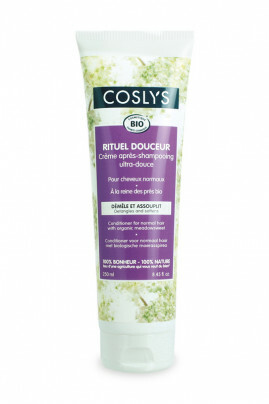 Coslys Organic Conditioner detangles normal hair without weighing it down thanks to its fluid light-weight texture. Sodium lauryl sulfate and silicone-free, it's packed with Organic Jojoba Oil to make your hair looks healthy and shiny. In combo with Coslys Shampoo, this Natural Conditioner leaves your hair soft and easy to style ! No silicon conditioner is the natural alternative to detangle your hair ! After washing your hair with Coslys Organic Shampoo, apply COSLYS Organic Natural Conditioner on wet hair. Let it pause for 2 min then rinse abundantly with clear water. Cruelty-free conditioner for naturally healthy hair !